The information contained in this site is provided is general in nature and is not personal financial, investment or taxation advice. This site is an information source only and does not constitute, and should not be taken as a substitute for specific advice. Given the changing nature of laws and regulations, and the specific nature of their application, information contained herein should be used for guidance only. Additionally none of the information in this website contains financial product advice, nor takes into account your personal objectives, financial situation or needs. If you require personal financial product advice you should consult an appropriately licensed authorised financial adviser. The information contained within this site is updated on a regular basis, however no person should act on the basis of this information without first obtaining the advice of a suitably qualified professional adviser. 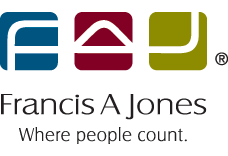 Francis A Jones (FAJ) gives no warranty and makes no representation as to the accuracy or sufficiency of any description or statement contained in this website and to the fullest extent of the law accepts no liability for any loss which may be suffered by any person who relies either wholly or in part upon the information presented. All information provided is subject to change without notice. Certain links in this site connect to external websites and/or servers maintained by third parties. FAJ takes no responsibility for the accuracy of any information contained in external sites.